I like to promote pride in being an incredible person! “Selling is primarily a mental game. When you are mentally focused and positively motivated you are in a better position to be of service to your potential clients. As a professional salesperson you need to be fired up, every day! Mental preparation, as a daily focus, helps you succeed in this very competitive role, more so in tough times. “Sylvia Perreault is a real inspiration! She will be a real added value to your business. Not only will her writings and seminars help equip you with the tools you need to be more successful, but what I like most is that she speaks knowingly; these are not borrowed theories or concepts. It’s her own experience that has brought her great results. Sylvia offers many motivational products! for her famous Book and E-book’s. These products are designed to stimulate either you or your team. But beware! Her pride is contagious and you will never see, the same way again, your business, your sales team or even your profession! You will be sold to Success! 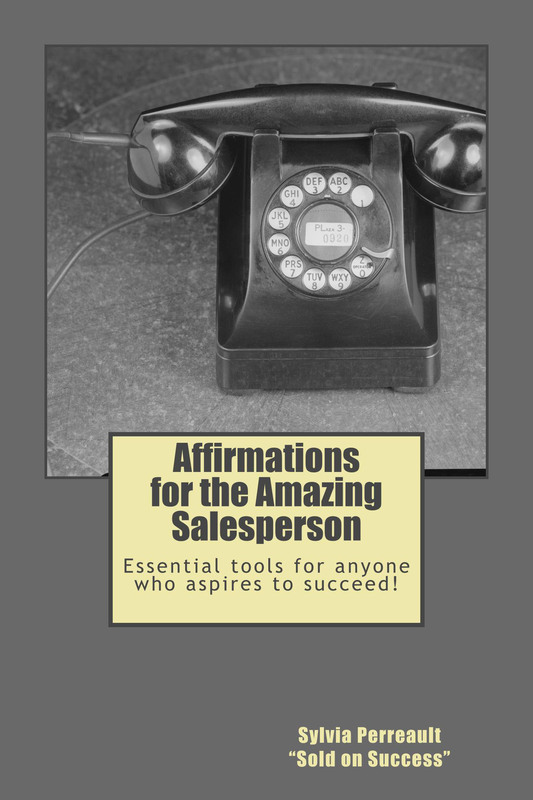 Affirmations for the Amazing Salesperson: Essential tools for anyone who aspires to succeed! Use the power of your thoughts to move you over any obstacles. This little negative voice that I often call the “¨Self-Saboteur” always overwhelms our thoughts at the wrong time! This voice grows more intense and increasingly uncontrollable when we are faced with greater challenges or when we demand of ourselves more self-confidence and emotional control. We need to surpass challenges with strength of character and a continuous, positive mindset. That is why affirmations are the perfect technique to maintain and strengthen your positive inner voice; the one you need to perform successfully and surpass yourself . I love selling And I am proud of it! 100+ pages of positives thoughts for your Sales Success and Souls!